Uniting to create an ambiance of radiance and warmth are the Ballroom’s rich wood finishes, brilliantly embellished wall coverings, deep-toned Axminster-woven wool carpet, and nine shimmering custom chandeliers. 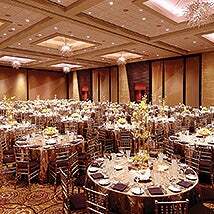 The Ballroom boasts a number of features that invite planners to indulge their creativity. The room’s more than 200 lights include fixtures that can be variously aimed as well as adjusted to different intensity levels. LED lights located within ceiling soffits are programmable to emit the glow of 64 different colors, which the frosted chandeliers reflect to enhance an event’s mood. Not overlooked in establishing the Ballroom’s cachet are the effects of distinctive furnishings, tabletop settings and decorative elements. Comfortable flex-back chairs; sleek, modern-design flatware; frosted water glasses, exquisite china, linen table cloths and napkins— all serve to confer a measure of prestige and create an elite setting.